Maximum Speed 100 ft. (wind); Acceleration 30 ft. Formerly known as the Man’s Promise, The Crisis is a three-masted sailing ship, 105 feet long and 30 feet wide (see the Skull & Shackles Player’s Guide). A minimum crew of 20 is required to sail her. Unless otherwise indicated, interior walls on the ship are of wood, 2 inches thick (hardness 5, hp 20, Break DC 20). Doors are of good wooden construction (hardness 5, hp 15, Break DC 18). Interior rooms are unlit during the day (except for those with windows or portholes), and usually have a single hooded lantern for light at night. The following items are so common aboard the Crisis that the PCs can easily access them at any time: barrels, baskets, blocks and tackle, candles, canvas, grappling hooks, hemp rope (any length up to 200 feet), lanterns, leather drinking vessels and waterskins, sacks, simple tools or hardware (especially carpentry tools such as hammers and nails), and any other simple items the GM deems appropriate. 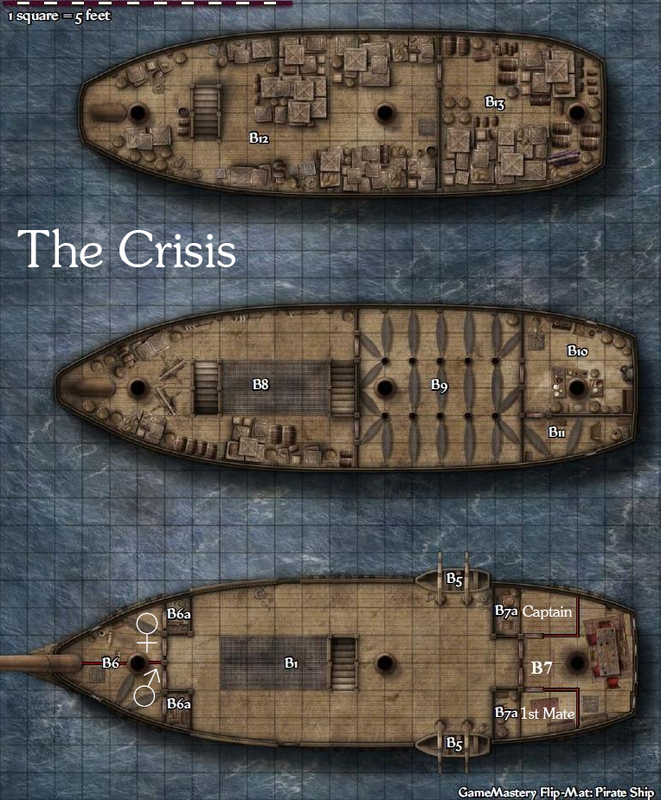 The decks and compartments of the Crisis are detailed below. B2. Foredeck: The foredeck rises 10 feet above the main deck. The ship’s nameplate on the hull reads Crisis. Marks in the hull suggest that previous nameplates existed before that one. B6. Officers’ Quarters: This tidy cabin has been split into men’s (port) and women’s (starboard) quarters. Each has a porthole to allow light and fresh air to enter. A hefty trap door sits in the floor of the men’s quarters, leading to the middle deck (area B8). B7. Captain’s Cabin: The rear wall of this cabin holds four gilt-framed windows that rise the full height of the chamber. The cabin contains a dining table and chairs, and a few chests and bookshelves. A trap door opens directly into the cook’s cabin below (area B11). The two doors opening onto the main deck and the trap door are locked with good locks. The windows do not open. Two smaller cabins have been carved out of this space, one each for the captain (starboard) and the first mate (port). B8. Middle Deck and Armory: The middle hold of the Crisis has been stocked with simple weapons and light armor, turning it into a working armory. Steps behind the foremast descend into the main hold (area B12). A second set of stairs against the aft bulkhead lead up to the main deck (area B1). This area also contains a light forge and workshop as well as a complete Alchemist’s Lab. Ezikial Hands slings his hammock in the forward part of this area. B10. Galley: This sizable galley contains a large stove against the aft bulkhead and a single porthole in the starboard wall. In one corner, a derrick stands next to a trap door that opens into the secure storage below (area B13). The door is locked with a huge, good padlock. It takes a full round to raise or lower the line on the derrick, which can lift up to 200 pounds of cargo. The galley has now been stocked. B12. Main Hold: The main hold of the Crisis contains a large water barrel secured to the starboard wall. Stairs behind the foremast lead up to the middle deck (area B8), while a trap door near the mainmast leads to the bilges, which contains two bilge pumps, forward and aft. If anything, there are more bilge spiders there than in the Wormwood.